Your child's success is very important to me. To create and maintain a positive learning environment for all students, I use the following expectations and consequences in my classroom. When things get hard, don't give up. Walk in the halls and classroom. Keep your hands and objects to your self. Keep things in their proper place. Do not keep others from learning. Ask permission before you borrow. 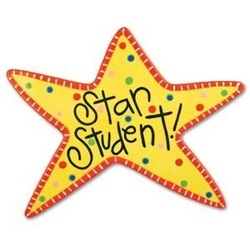 Positive Consequences: "STAR" students are rewarded with only positive Class Dojo points. When a child receives 50 points, they can get a prize such as a homework pass from the treasure box. I use this consistently at the beginning of the year, but I try to phase it out as the year progresses. To keep your information private, I don't use the email application for this program. A verbal warning is given reminding them of the consequence of their choice. Students may have to write a "think-sheet" to their parents explaining their poor choice and the good choice solution. The parent and the office are contacted for extremely hurtful, destructive or chronic negative behavior choices.